Ship Weight : 6 lbs. Check out this Organic English Breakfast. 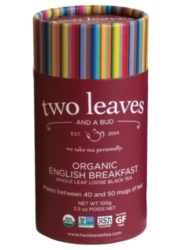 Two Leaves Tea in Organic English Breakfast is an organic black tea blend which includes flowery orange pekoe leaves resulting a deep amber color when brewed. This tea will make an excellent addition to anyone�s morning routine or for any part of the day. Two Leaves Organic Early Grey is sold by the case. Each case contains 6 cylinders. Each cylinder is 100g and will make between 40 and 50 mugs of tea.